The cooking of the coastal regions of East Africa, from Kenya to Mozambique, is a fantastic mix of Arab, Indian, European and African influences. This recipe draws from all of them. Wash all the fish and the prawns and pat them dry. Wash the prawn heads and shells. Heat 1 tbsp groundnut oil in a saucepan over a medium heat. Add the prawn heads and shells, the coriander seeds and the cumin and cook until the prawn shells have turned orange and are just beginning to colour (about 4 minutes). Add 100ml water and the coconut milk and simmer for 10 minutes. Strain through a sieve and discard the prawn shells. Meanwhile, heat 1cm depth oil in a frying pan over a high heat and fry the fish and prawns in batches, for a minute or so each side, or until just cooked. Remove with a slotted spoon and keep warm on kitchen paper. Drain off all but 3 tbsp of the oil from the frying pan and add the onions, garlic and chilli. Turn the heat down and fry gently for 10-15 minutes, scraping up any bits of fish stuck to the pan. 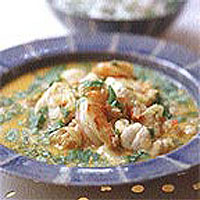 Add the lime juice and zest and the strained coconut and prawn liquid and bring to the boil. Stir in the fresh coriander and remove from the heat. Season. Arrange the fish in a shallow dish and pour over the sauce. Eat with rice or a simple salad. The dish is also delicious if served tepid as a salad.